Hi again, it's been ages since I've posted, although I have made a couple of cards. This one was for a work friend who wanted a rustic wedding card that included kraft and lace. I didn't have lace but thought the paisley embossing and stamping might be ok, and it was! 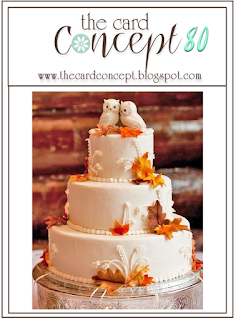 At The Card Concept there is a gorgeous inspiration pic for autumn love. I was inspired by the delicate texture on the white cake and the touches of brown and gold. 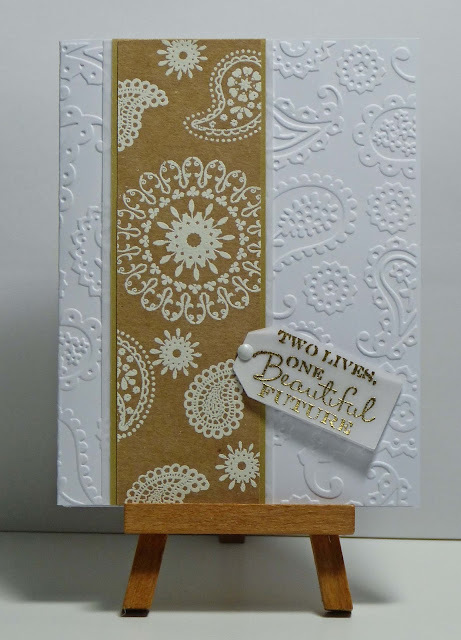 Perfectly paisley embossing folder; Annabelle stamps wedding medallion stams and sentiment; Stampin Up paisley stamp from the Wanted set; Hero Arts lace paisley stamp; versamark ink and white embossing powder; versafine ink and detail gold embossing powder; vellum and tag punch. This is so elegant. The paisley makes a lovely wedding card and a very touching sentiment. Lovely Wedding card, perfect sentiment. Fabulous embossing on this beautiful card, Cathy. 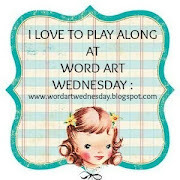 THanks so much for sharing your art with us. I hope you will join us again soon.